The building’s parent object must have the Building Health component attached to it. 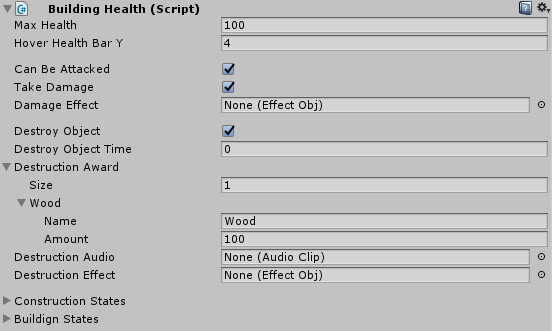 This is the component that handles the building’s health settings. Maximum Health: Maximum health points for this building. Hover Health Bar Y/Height: When moving the mouse over a building’s object, a health bar would appear. This is the health bar’s position on the y axis. Can Be Attacked: If disabled, then enemy factions will not be able to target this building to be attacked. Take Damage: if disabled, then enemy factions will be able to target this building to attack it but the building will not receive any damage from the attacks. Destroy Object Time: After how much time (in seconds) should the building’s object be destroyed after it hits zero health (if the above option is enabled). Destroy Award: This array allows the faction that destroyed this building to get resources as a reward. The resource types and their respective amounts can be assigned inside this array. Destruction Audio: Audio clip played when this building is destroyed. Destruction Effect: When the building is destroyed, this effect object will be shown on the building’s position. Max Health: If the building’s current health while it’s being constructed is lower than this, then the building is in this construction state. Show And Hide: Assuming that the building is currently in this construction state, there are two cases: If enabled then objects in the Show Child Objects array field will be activated and objects in the Hide Child Objects array field will be hidden. If disabled then the object in the Child Object field will be simply activated as long as the building is in this construction state. Max Health: If the building’s current health is lower than this, then the building is in this state. Show And Hide: Assuming that the building is currently in this state, there are two cases: If enabled then objects in the Show Child Objects array field will be activated and objects in the Hide Child Objects array field will be hidden. If disabled then the object in the Child Object field will be simply activated as long as the building is in this state.